Is This The End Of The Road For Obama? It is a universal political truth that administrations do not begin to fragment when things are going well: it only happens when they go badly, and those who think they know better begin to attack those who manifestly do not. The descent of Barack Obama’s regime, characterized now by factionalism in the Democratic Party and talk of his being set to emulate Jimmy Carter as a one-term president, has been swift and precipitate. It was just 16 months ago that weeping men and women celebrated his victory over John McCain in the American presidential election. If they weep now, a year and six weeks into his rule, it is for different reasons. The once mighty Detroit seems to be on the verge of being abandoned. Despite the efforts of some sections of opinion to talk the place up, America is mired in unhappiness, all the worse for the height from which Obamania has fallen. The economy remains troublesome. There is growth – a good last quarter suggested an annual rate of as high as six per cent, but that figure is probably not reliable – and the latest unemployment figures, last Friday, showed a leveling off. Yet 15 million Americans, or 9.7 per cent of the workforce, have no job. Many millions more are reduced to working part-time. Whole areas of the country, notably in the north and on the eastern seaboard, are industrial wastelands. 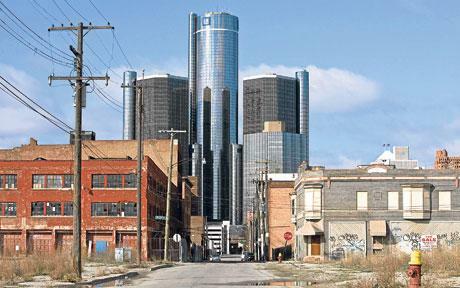 The once mighty motor city of Detroit appears slowly to be being abandoned, becoming a Jurassic Park of the mid-20th century; unemployment among black people in Mr. Obama’s own city of Chicago is estimated at between 20 and 25 per cent. One senior black politician – a Democrat and a supporter of the President – told me of the wrath in his community that a black president appeared to be unable to solve the economic problem among his own people. Cities in the east such as Newark and Baltimore now have drug-dealing as their principal commercial activity: The Wire is only just fictional. Last Thursday the House of Representatives passed a jobs Bill, costing $15 billion, which would give tax breaks to firms hiring new staff and, through state sponsorship of construction projects, create thousands of jobs too. The Senate is trying to approve a Bill that would provide a further $150 billion of tax incentives to employers. Yet there is a sense of desperation in the Administration, a sense that nothing can be as efficacious at the moment as a sticking plaster. Edward B Montgomery, deputy labor secretary in the Clinton administration, now spends his time on day trips to decaying towns that used to have a car industry, not so much advising them on how to do something else as facilitating those communities’ access to federal funds. For a land without a welfare state, America starts to do an effective impersonation of a country with one. This massive state spending gives rise to accusations by Republicans, and people too angry even to be Republicans, that America is now controlled by “Leftists” and being turned into a socialist state. “Obama’s big problem,” a senior Democrat said, “is that four times as many people watch Fox News as watch CNN.” The Fox network is a remarkable cultural phenomenon which almost shocks those of us from a country where a technical rule of impartiality is applied in the broadcast media. With little rest, it pours out rage 24 hours a day: its message is of the construction of the socialist state, the hijacking of America by “progressives” who now dominate institutions, the indoctrination of children, the undermining of religion and the expropriation of public money for these nefarious projects. The public loves it, and it is manifestly stirring up political activism against Mr. Obama, and also against those in the Republican Party who are not deemed conservatives. However, it is arguable whether the now-reorganizing Right is half as effective in its assault on the President as some of Mr. Obama’s own party are. Mr. Obama benefited in his campaign from an idiotic level of idolatry, in which most of the media participated with an astonishing suspension of cynicism. The sound of the squealing of brakes is now audible all over the American press; but the attack is being directed not at the leader himself, but at those around him. There was much unconditional love a year or so ago of Rahm Emanuel, Mr. Obama’s Chief of Staff; oleaginous profiles of this Chicago political hack, a veteran of that unlovely team that polluted the Clinton White House, appeared in otherwise respectable journals, praising the combination of his religious devotion, his family-man image, his ruthless operating technique and his command of the vocabulary of profanity. Now, supporters of the President are blaming Mr Emanuel for the failure of the Obama project, not least for his inability to construct a deal on health care. This went down badly with friends of Mr Emanuel, notably with Mr. Emanuel himself. His partisans, apparently taking dictation from him, have filled newspaper columns and blogs with uplifting accounts of the Wonder of Rahm: as one of them put it, “Emanuel is the only person preventing Obama from becoming Jimmy Carter”. They attack other Obama “sycophants”, such as David Axelrod, his campaign guru, and Valerie Jarret, a long-time friend of Mrs. Obama and a fixer from the office of Mayor Daley of Chicago who now manages – or tries to manage – the President’s image. These “sycophants” have, they argue, tried to keep the President above politics, letting Congress run away with the agenda, and gainsaying Mr. Emanuel’s advice to Mr. Obama to get tough with his internal opponents. This naive act of manipulation has brought its own counter-counterattack, with an anti-Emanuel pundit drawing a comparison with the UK’s own Prime Minister and ridiculing the idea that Mr. Obama should start bullying people too. The root of the problem seems to be the management of expectations. The magnificent campaign created the notion that Mr. Obama could walk on water. Oddly enough, he can’t. That was more Mr. Axelrod’s fault than Mr. Emanuel’s. And, to be fair to Mr. Emanuel, any advice he has been giving the President to impose his will on Congress is probably well founded. The $783 billion stimulus package of a year ago was used to further the re-election prospects of many congressmen, not to do good for the country. America’s politics remain corrupt, populated by nonentities whose main concern once elected is to stay elected; it seems to be the same the whole world over. Even this self-interested use of the stimulus package appears to have failed, however. Every day, it seems, another Democrat congressman announces that he will not be fighting the mid-term elections scheduled for November 2. The health care Bill, apparently so humane in intent, is being “scrubbed” (to use the terminology of one Republican) by its opponents, to the joy of millions of middle Americans who see it as a means to waste more public money and entrench socialism. For the moment, this is a country vibrant with anger. A thrashing of the Democrats in the mid-terms would not necessarily be the beginning of the end for Mr. Obama: Bill Clinton was re-elected two years after the Republicans swept the House and the Senate in November 1994. But Mr. Clinton was an operator in a way Mr. Obama patently is not. His lack of experience, his dependence on rhetoric rather than action, his disconnection from the lives of many millions of Americans all handicap him heavily. It is not about whose advice he is taking: it is about him grasping what is wrong with America, and finding the will to put it right. That wasted first year, however, is another boulder hanging from his neck: what is wrong needs time to put right. The country’s multi-trillion dollar debt is barely being addressed; and a country engaged in costly foreign wars has a President who seems obsessed with anything but foreign policy – as a disregarded Britain is beginning to realize. There are lessons from the stumbling of Mr. Obama for our own country as we approach a general election. Vacuous promises of change are hostages to fortune if they cannot be delivered upon to improve the living conditions of a people. The slickness of campaigning that comes from a combination of heavy funding and public relations expertise does not inevitably translate into an ability to govern. There is no point in a nation’s having the audacity of hope unless it also has the sophistication and the will to turn it into action. As things stand, Barack Obama and America under his leadership do not.